What’s the difference between the different wheel sizes? Do I need a chain guard? Choosing the best bike for a 5-year-old can be difficult; in 2019, there are a huge number of different options available, and many of these come with more extra features than your child might need. Finding the best bike for your 5-year-old depends on a number of factors, such as their ability to ride a bike, their height, and what kind of riding you’re anticipating them to do. Every child has different needs and expectations from a bike, and it is important to choose the right kids’ bike for your child’s needs. These reviews will help you to buy with confidence, knowing that the bike you’ve chosen will be a good fit and the right one for your 5 year old’s particular needs. For younger children and toddlers, check out these bikes for 2-year-olds. The Dynacraft Magna Gravel Blaster is a starter BMX bike, designed for riding on gravel and other such rough surfaces. 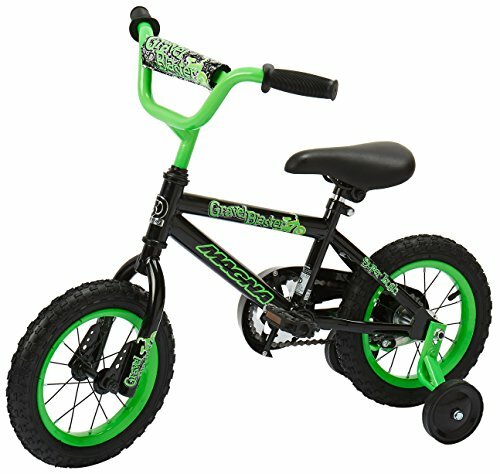 With small 12″ wheels, it’s visibly a BMX rather than a road bike and offers excitement and fun to any 5 years old who wants more from riding a bike than just road transport. It also comes with training wheels, for kids whose ambition is greater than their cycling ability, allowing even relatively hesitant riders to get into the fun of cycling without worrying too much about falling over. The handlebars are padded for extra comfort, and the rear wheel has a coaster brake hub fitted, allowing for easy, fast braking. Why We Liked It – The Dynacraft Magna Gravel Blaster is an excellent choice for kids that want an early start on BMX biking rather than just road cycling. It’s designed for safety and confidence and brings fun to cycling from an early age. 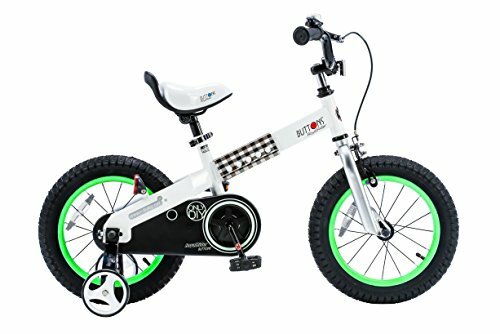 The RoyalBaby BMX Freestyle Kid’s Bike is another entry-level BMX bike for kids who want to get a little more excitement out of the early stages of learning to ride a bike. Designed for cycling on gravel and other rough surfaces, the RoyalBaby BMX Freestyle bike has a range of different wheel sizes available, from 12” for the full BMX experience to 20” for more of hybrid bike design. The frame is easy to assemble, and the seat comes with a quick-release post for quick and easy adjustment. It also comes with extra accessories, such as a bike water bottle holder, a bell, and a solid chain guard for extra security and safety. Why We Liked It – The RoyalBaby BMX Freestyle Kid’s Bike is an easily adjustable starter BMX with all the extra trimmings you could ever need. It’s great for kids that want something a little flashier, or kids that are expected to grow fast. The Schwinn Jasmine Girl’s Bike with Training Wheels is a lightweight training road bike with a number of neat extra design features. 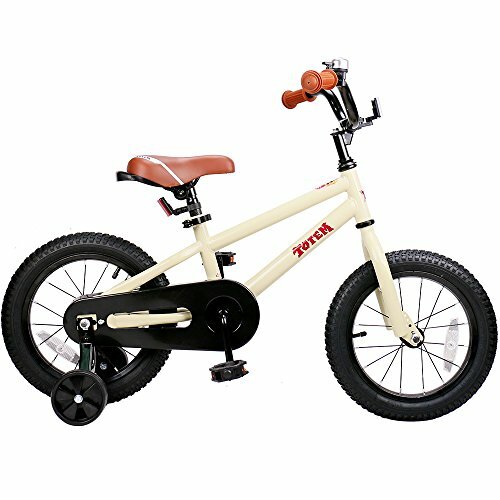 It comes with both a coaster brake for easy stopping and a hand brake, to make the transition to a larger bike equipped with only a hand brake a bit easier for your child. The seat is easily adjusted to fit a rapidly-growing child, and the bike comes with sturdy training wheels. It also has a small front-mounted basket in colors that match the frame, enabling your child to carry things around with them easily while riding the bike. Why We Liked It – The combination of a coaster brake and hand brake is a great design idea, making that tricky transition from a starter bike to a larger one with only a hand brake a bit easier. 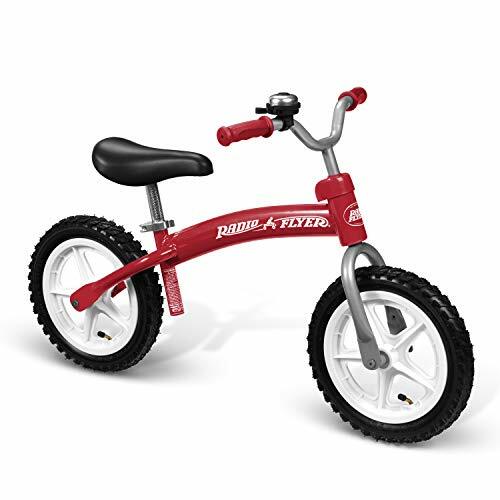 The JOYSTAR Kids Bike with training wheels is a sturdy all-round bike designed to work well for any child, covering a broad range of tastes and purposes. Neither specifically, a BMX or a road bike, the JOYSTAR comes in a variety of different wheel sizes, from the BMX-like 12″ to a more road bike-like 16″. Whatever size you go for, though, it’s sturdy enough to survive pretty much any sort of use and neutrally designed enough to blend in with any other group of bikes rather than standing out. It comes with a number of safety features, such as a sturdy chain guard and a set of training wheels, but also comes with some handy accessories, such as a bell. Why We Liked It – A great all-rounder, the JOYSTAR Kids Bike will fit pretty much any child’s needs, and even comes with decals for them to personalize the chain guard themselves! 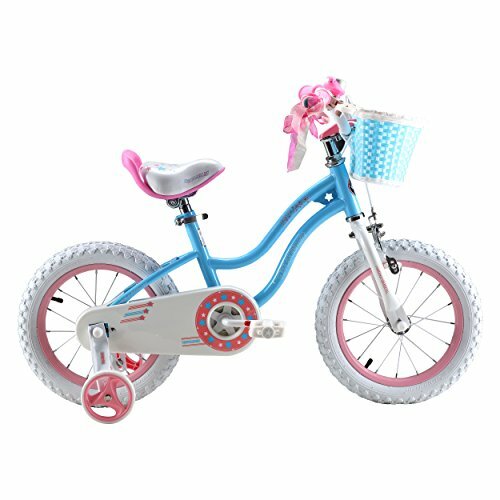 The JOYSTAR Girl’s Bike with training wheels comes in a range of different sizes for kids of different sizes and ability levels. While the smaller options (14” to 16” wheel sizes) come with training wheels, the larger options (16” to 18” wheel sizes) have a hand brake as well as the coaster brake all models come with, making the transition to a larger hand brake bike easier. The 18” model also comes with a kickstand, enabling it to stand up when stationary in the same way that the training wheels allow for smaller models. It also has a sturdy frame designed for support when riding over rough ground. 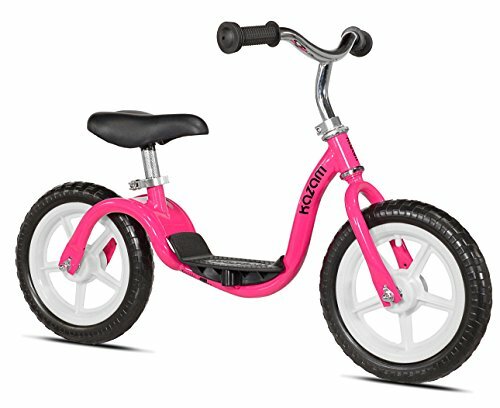 Why We Liked It – A sturdy and customizable bike, there’s a model of JOYSTAR Girl’s Bike for pretty much any child. The dual brake options allow kids to get the hang of hand braking before being let loose on a bike with no coaster brake. As the name suggests, the Dynacraft Magna Major Damage bike is designed for fun and excitement. 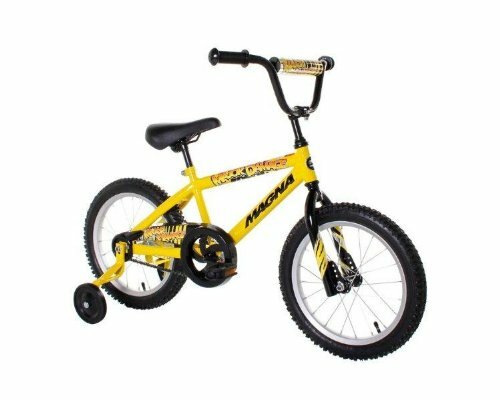 Coming in a bright black and yellow color scheme with “major damage” emblazoned across the frame, this is a bike that lets more adventurous kids get started on BMX riding from an early stage. It is, however, easily adjustable, allowing it to still be used by kids up to age 8. 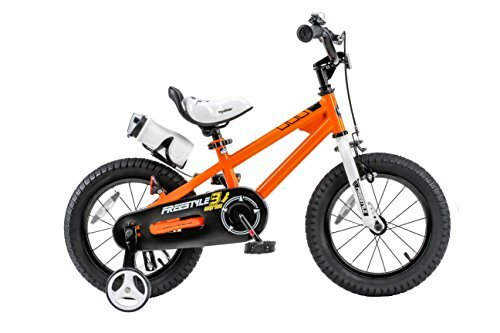 The training wheels are removable, allowing the bike to stay useful as your child outgrows the need for training wheels, and can even be adjusted as your child grows. Why We Liked It – The adjustability is the major selling point of the Dynacraft Magna Major Damage bike. The adjustable and removable training wheels and the easily adjusted seat height allow your child to keep using this one for a long time, even when growing fast! 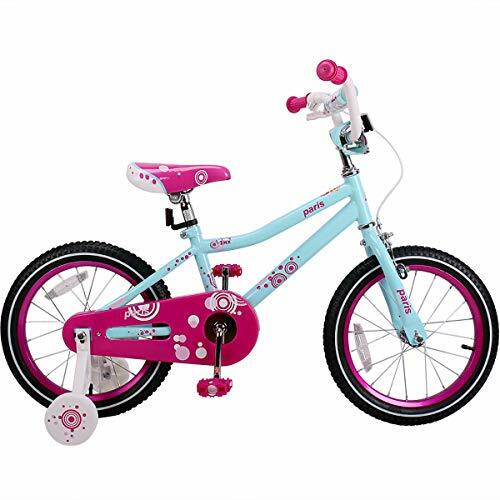 The RoyalBaby Stargirl Girls bike is another of those bikes that come in a wide range of different size options, each with its own accessories. In this case, the 12” to 16” wheel sizes come with training wheels, while the 16” to 18” models come with a kickstand. All sizes, though, have both a coaster brake for easy use and a hand brake to help your child become accustomed to handing braking before transitioning to a larger bike that comes with only a hand brake. All sizes also come with a basket and bell, allowing kids to carry things around while riding. Why We Liked It – Most RoyalBaby bike models come with dual brake options, and the RoyalBaby Stargirl is no exception. This is a great way to get kids accustomed to hand braking while they still have coaster brakes to fall back on. 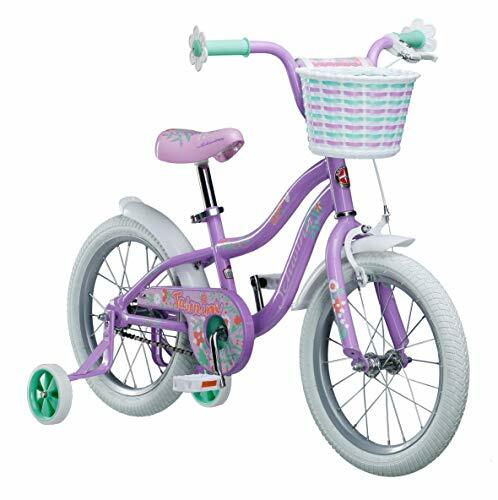 The RoyalBaby Honey and Buttons Kids bike is, unusually for RoyalBaby, available in unisex designs and colors. An extra-sturdy bike for kids, it is available in a range of different sizes with different accessories. The 12″ to 16″ wheel sizes come with training wheels, while the 16″ to 18″ models come with a kickstand. All sizes, as usual for RoyalBaby, come with both coaster brakes for easy use and hand brakes, helping kids learn to use hand brakes before moving onto a larger bike with no alternative braking method. The seat is well-padded for comfort even on rough surfaces, and the bike comes with a bell and a set of tools for easy assembly and accessorization. Why We Liked It – The majority of RoyalBaby’s bikes are aimed specifically at girls, so it’s a nice change to see one with a unisex design, especially as their focus on dual brake systems is a major help to the learning process of most kids. The Radio Flyer Glide N Go Balance Bike is a little different from most of the bikes for 5-year-olds available on the market, focusing specifically on helping your child learn to stay upright on a bicycle. The Glide N Go does not have pedals or training wheels, putting the focus specifically on learning to stay upright without either of these aids. The seat is easy to adjust for children of all sizes, as well as being comfortably padded for the smoothest ride possible. The specific focus on balance means that this isn’t a great bet for transport, but it’s a fantastic learning tool! Why We Liked It – The Radio Flyer Glide N Go Balance Bike offers an unusual approach to learning to ride a bike, but it’s one that might help kids learn faster than a conventional bike with training wheels. The KaZAM v2e No-Pedal Balance Bike is, like the Radio Flyer discussed above, focused on teaching children to balance on a bike. Lacking pedals and training wheels, this bike is designed for easy balance, giving kids an advantage in the move to adult bike designs. The footrest is carefully located to help your child find their center of gravity, speeding up the process of developing balance as much as possible. Adjustable to fit children of different sizes, the KaZAM No-Pedal Balance Bike can help kids to find their confidence quickly while providing an easy, maintenance-free tool for parents. Why We Liked It – The KaZAM v2e No-Pedal Balance Bike offers a slightly more innovative design than the Radio Flyer, with a footrest to help kids learn to balance faster. The difference between road bikes and BMX bikes isn’t as pronounced in bikes for 5-year-olds as it is in adult bikes, as most small bikes have disproportionately small wheels like those of BMX bikes anyway. Some kids bikes are explicitly marketed as BMX bikes, and these usually have slightly rougher tires than those not marketed as such. If you’re expecting your child to do almost all of their cycling off-road on rough terrain, that might be a worthwhile consideration, but for most purposes, any bike of approximately the same size will handle in a very similar way. Training wheels are helpful for learning to ride a bike, as they reduce the risk of falling over by providing extra support to the bike. Most smaller bikes will have them, but a number of the larger models discussed above (particularly those with 18” wheels) are not equipped with them. While it should be possible to fit separate training wheels to most bikes, it is worth checking whether the bike you’re looking to buy comes with them as standard or not, as some don’t come with them! This is especially worth considering if your child is particularly tall, as larger bikes tend to be less likely to come with their own training wheels as standard. Contrasting against the training wheels of most bikes, balance bikes are designed specifically to teach kids to balance on a bike without any aids. Lacking both training wheels and pedals, these bikes focus purely on balance. Kids taught with these are likely to become proficient cyclists faster and more easily than those who learn on normal bikes, but the major disadvantage of balance bikes is that they can’t be used as a general mode of transport. Even a small training bike can be used to help your child get around town a bit faster, but the pedal-free design of balance bikes means that they have no transport functionality at all and are only useful as a learning tool. One of the things true of almost every 5 years old is that they’re growing fast. Bikes are expensive, so reducing the risk that your child is going to outgrow the bike faster than you’d like them to is important. Fortunately, most bikes can be easily adjusted, with both the seat column and the handlebars being moveable. Some bikes are more easily adjusted than others, however; it is worth checking whether the bike you’re looking to buy can have its seat and handlebars easily loosened and adjusted by hand, or whether they will require tools to disassemble. One of the major advantages of bikes designed for 5-year-olds is that they’re smaller and lighter than bikes made for adults, and therefore a lot easier to transport if needed. It should be easily possible to pick most of them up and carry them around with minimal effort, although some of the sturdier BMX models are made with a heavier steel frame, requiring more effort to carry. Training wheels add a lot of horizontal volume to a bike, though, and can be quite inconvenient for storage. In addition to this, no child’s bike is going to be quite as compact as an adult folding bike, although the light weight of a small bike is likely to make a lot of difference to its ease of transport. What about accessories like bells, baskets, and water bottle holders? Most of those can be easily purchased separately and attached to the bike, but some of the bikes on the market in 2019 come with them already attached. They can make kids feel more engaged with learning to ride on a bike, with bells, in particular, adding a level of fun to the process. On the other hand, they’re yet another extra feature on a product your child is likely to grow out of relatively quickly, so consider exactly how important such features might be to your child’s engagement and sense of enjoyment. Most of the bikes discussed above have wheels in sizes ranging from 12″ diameter to 18″ diameter – a fairly substantial difference! The most apparent result of this difference is that bikes with larger wheels are going to generally be larger, standing taller from the ground than those with smaller wheels. In addition to this, however, the different wheel sizes offer a different riding experience. Larger wheels give a smoother ride, making bumps in the ground less noticeable, while smaller BMX-style wheels allow for more control, letting the rider feel the contours of the ground more accurately. The height difference is the more important consideration, though, and your child’s leg length will determine which size of the wheel is right for them. Most bikes for children come with solid chain guards, a feature absent from adult bikes. These guards protect your child’s clothes from getting caught in the chain, reduce the potential for injury, and prevent staining or soiling of clothes and hands from the oils on the chain. In the event of problems with the chain, however, the chain guard can make maintenance a more difficult prospect. As such, there are advantages and disadvantages to chain guards, and you should consider how intense your child’s use is likely to be. More intense use is likely to lead to more chain problems and maintenance than more casual use, while for more casual use the safety and cleanliness benefits of the chain guard are likely to prove more valuable. There are a large number of different options available when buying a bike for a 5-year-old in 2019, but with this guide, you can buy with full confidence that you understand the difference between the different models available. The needs of your child are the most important consideration, and there should be a bike out there to fit any combination of needs you may have. The advantage of the market is so broad is that with enough looking it should be possible to find anything, and this guide exists to help you narrow that down a bit. The ONLY balance bike with an easy step-in patented FOOTREST design. Adjustable seat and handlebars - KaZAM accommodates ages up to 5 years.